Madonna was campaigning for female empowerment across the globe at the 2013 Sound Of Change concert, but fans seemed more fixated on her “swollen” face as she took to the stage at London’s Twickenham Stadium on Saturday night. Within moments of Madonna appearing in front of a crowd of thousands, audience members took to Twitter to slam her somewhat puffy-faced look as she presented a segment of the charity gig. Madonna’s look was all the more obvious thanks to her conservative ensemble, which saw her cover up from head to toe in a black high-necked sweater and matching trousers. Wearing her honey blonde locks pulled back from her face, Madonna’s facial features were clear to see. And although fans seemed thrilled to see Madonna, 54, support such a worthwhile cause, some admitted they were a little distracted by her puffy-faced appearance. But it didn’t seem as though the star cared too much about her appearance as she received a rapturous applause from the packed-out stadium as she called on her fans to start a “revolution of love”. 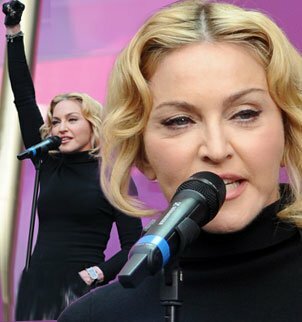 Madonna said: “I keep telling people I want to start a revolution, but my revolution doesn’t involve bloodshed and violence. My revolution starts with education. My revolution is about achieving a higher level of consciousness, but this cannot start without education. “We cannot change this world, nor begin to treat each other with human dignity, without an education. Let tonight be the beginning of this revolution because education is not a luxury, it is a basic human right. Madonna has previously insisted she hasn’t undergone any cosmetic procedures, but would not rule it out in the future. The star said: “I am what I am. And I don’t like the idea of someone putting you to sleep then taking knives to you. The Sound Of Change concert was part of Gucci’s new global campaign for girls’ and women’s empowerment, and is being broadcast across six continents to over 150 countries, with more than one billion people expected to see it in total. The charity has put on the concert in conjunction with the Chime For Change initiative, which aims to raise awareness of education, health and justice for women everywhere. Beyonce, Jennifer Lopez and Rita Ora were among the stars taking to the stage to perform for at the star-studded event, while the likes of Blake Lively, Jessica Chastain and Ryan Reynolds presented segments of the gig.